Having gathered support from all the municipalities in the Lake George watershed and studied the issue while collecting data for the past three years, an environmental group is hoping for a 50 percent cut in road salt use there by 2020. 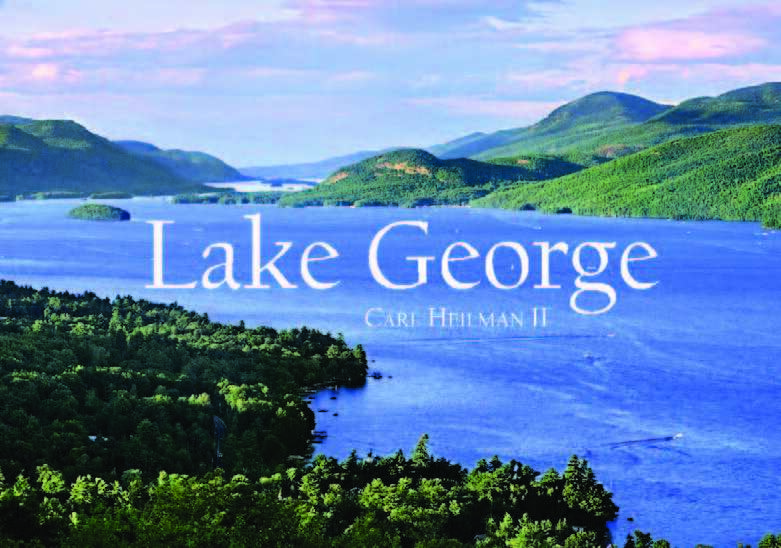 “It’s called the acid rain of our time,” Eric Siy, executive director of The Fund For Lake George, told municipal officials and environmentalists gathered in early October at the Fort William Henry Conference Center. He likened deposition from Midwestern coal-fired power plants — which made Adirondack lakes more acidic before tougher federal smokestack controls — to winter salt entering ground and surface water and the 32-mile-long lake, changing its chemistry. The Fund has been helping town and village public works departments buy better snowplow blades that can more closely follow road contours, and trucks that spread brine ahead of snowstorms to prevent ice and snow from sticking to roadways. Both are credited with reducing the salt needed to make roadways safe for driving. About 15,000 metric tons of road salt are applied yearly in the watershed, and probably a nearly equal amount on private parking lots, Siy told the group’s fourth annual “Salt Summit.” Every municipality within the basin has signed a memorandum supporting better practices to cut salt use, he said. The 2020 goal is to have all the municipalities manage salt wisely while engaging the private sector to join the effort. Other practices include calibrating salt spreaders, monitoring amounts used, and salting according to conditions including road temperature. Those steps also cut amounts used and municipal costs. 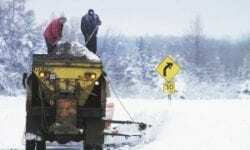 New York’s Department of Transportation this winter plans to test better salt management practices for 17 miles of Route 9N north from Lake George Village and 16 miles of Route 86 from Lake Placid to Wilmington. 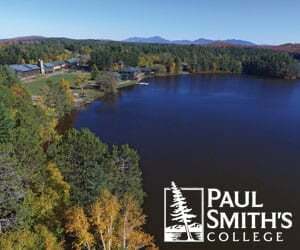 The pilot project followed a recent study by the Adirondack Watershed Institute at Paul Smith’s College showing high concentrations of salt components sodium and chloride in lakes and wells downslope from state roads in the Adirondack Park, where waterways naturally have very little salt. The study showed the state uses far higher salt concentrations than municipalities, some of which just plow or also apply sand for driving traction. 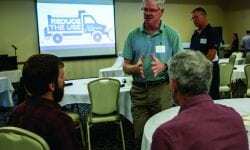 “We think we can reduce our application rates a little bit,” said Rob Fitch, director of DOT’s Office of Maintenance. Crews plan to try brine on Route 9N and some aggregates for traction on Route 86, use the segmented plow blades, and closely calibrate salt spreaders and monitor use. They may be able to cut some salting runs, he said. The institute’s studies also identified high salt levels in private wells located downslope from state highways, which are more heavily salted than local roads. Results from 358 Adirondack wells tested by the institute found that water from sixty-three wells—55 percent of those downslope from state roads—contained sodium at levels above the federal guideline of 20 ppm for people on low-sodium diets. The median level was 26 ppm, and the maximum was 748 ppm. Dan Kelting, the institute’s director, said Adirondack water usually contains less than 1 ppm of sodium and less than 0.5 ppm of chloride when the source is away from roads. He said the study shows that road salt from state highways is contaminating wells and surface aquifers in the Adirondacks. In the past, the institute has found road salt in high concentrations in many Adirondacks lakes and streams. Testing is continuing, he said. Notices of claim have been filed on behalf of a dozen clients against the state and several Adirondack counties and towns that spread salt, generally on behalf of the state, seeking the cost of drilling new uncontaminated wells, attorney Bill Owens said. “We’re really in the very early stages,” he said. New York spends about $214 million over the most recent snowplowing year, according to New York’s Office of General Services. 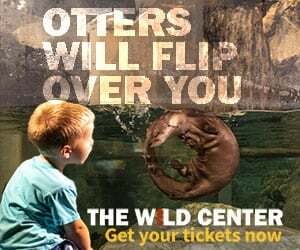 State agencies and authorities, local governments, school districts and other authorized users can buy it from centralized OGS contracts. They have bought some 3.6 million tons for the coming winter. In 2015, Gov. Andrew Cuomo announced $400,000 in state economic development grants for American Rock Salt’s expansion in Livingston County, south of Rochester, saying that would help retain 300 jobs and create 55 new positions at the largest salt mine in the U.S.
WIT Advisers and the Sustainable Winter Management(SWiM™) http://www.witadvisers/swim is very proud solutions supporter of the Lake George regions salt reduction effort.